General information about this repository, including legal information, build instructions and known issues/limitations, are given in README.md in the repository root. This ROS 2 package provides few examples for the use of the fmi_adapter package. It contains two FMU files DampedPendulum.fmu and TransportDelay.fmu (both created with the FMU SDK) and corresponding launch files. Furthermore, it includes a model of a damped pendulum in the Modelica language to create your own FMU. Use ros2 launch fmi_adapter_examples simple_damped_pendulum.launch.py to simulate a damped pendulum (share/DampedPendulum.fmu) with a length of 1m. The pendulum's angle is published at topic /a with the default rate of 100Hz. The step size of the FMU's solver is 1ms. To print the angle data on another console, invoke ros2 topic echo /a. damped_pendulum_with_transport_delay.launch.py starts two nodes named /example/damped_pendulum and /example/transport_delay. The first one simulates share/DampedPendulum.fmu, where the length parameter is set to 25m by the launch file. The second node runs share/TransportDelay.fmu, where the delay parameter is set to 2.33s. The input subscription of the transport delay is remapped to the pendulum's angle topic and the delayed angle is published at /example/y. There are several modeling tools that support the Modelica language and provide FMU export. Examples are Dymola, JModelica, and OpenModelica. In the following, we explain the process by the example of OpenModelica, which has been also used to create the model of the damped pendulum at share/DampedPendulum.mo. 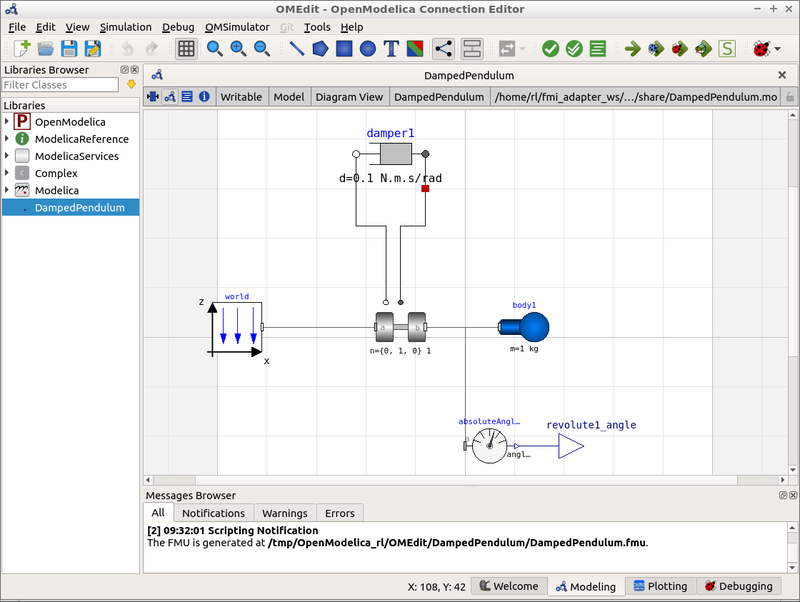 Download and install OpenModelica for Linux as described in https://openmodelica.org/download/download-linux. Launch OMEdit and load the share/DampedPendulum.mo model file. Click on the DampedPendulum model in the project tree on the left. Navigate to Tools -> Options -> FMI and ensure that Version=2.0, Type=Co-Simulation and Platforms=Dynamic is selected. Then click FMI -> Export FMU. The path of the resulting FMU file is shown in the message browser at the bottom of the window, typically /tmp/OpenModelica_[user]/OMEdit/DampedPendulum.fmu. Now, you are prepared for simulating the FMU using the fmi_adapter package. Please see the README.md of the fmi_adapter package for how to load and run an FMU inside an application-specific ROS node or library. according to https://github.com/OpenModelica/OMCompiler/pull/2397/files and export the FMU again. Details on this bug are given in https://trac.openmodelica.org/OpenModelica/ticket/4899. Cleaned up dependency entries in package.xml. Fixed missing testing and launch dependencies. This ROS package provides few examples for the use of the fmi_adapter package. It contains two FMU files DampedPendulum.fmu and TransportDelay.fmu (both created with the FMU SDK) and corresponding launch files. Furthermore, it includes a model of a damped pendulum in the Modelica language to create your own FMU. Use roslaunch fmi_adapter_examples simple_damped_pendulum.launch to simulate a damped pendulum (share/DampedPendulum.fmu) with a length of 1m. The pendulum's angle is published at /fmi_adapter_node/a with the default rate of 100Hz. The step size of the FMU's solver is 1ms. damped_pendulum_with_transport_delay.launch starts two nodes. The first one simulates share/DampedPendulum.fmu, where the length parameter is set to 25m by the launch file. The second node runs share/TransportDelay.fmu, where the delay parameter is set to 2.33s. The input subscription of the transport delay is remapped to the pendulum's angle topic and the delayed angle is published at /transport_delay/y. Both launch files also open rqt_plot to visualize the angle(s). Added two sample FMUs with corresponding launch files. Throwing runtime_error in case of failed fmi2 function call in FMIAdapter.